His name is John C. Taylor and at age 94 has done more than most people in their lifetime. He appeared on Doctor OZ during an anti-aging show and continues to defy the adage of slowing down as you get older. 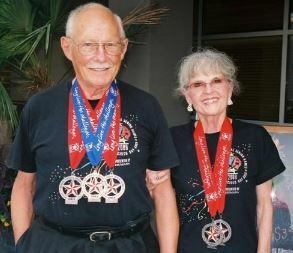 John C. Taylor at 94 is the only person to have done a triathlon over the age of 90 in the National Senior Games. John qualified for the GA Golden Olympics, Florida State Senior Games…rides his bike, swims laps and has been tossed over the handle bars 3 separate times! He and his companion Sally enjoy the outdoors and aren’t slowing down. Here’s to a life of remaining active and filled with joy, health and love! Tom Sullivan is a Television Host and Corporate Emcee based in Atlanta Georgia.